Animal bites are one of the most common reasons for personal injury cases. Every year, roughly 4.7 million Americans are bitten by an animal, 800,000 of which require medical care. Unfortunately, some of these cases are fatal. An average of 31 dog bites result in fatality each year. Most of these fatalities involve children who are less than 10 years of age. 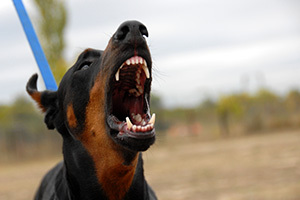 Many times, dog bites occur on or near the property of the victim, and most victims have some knowledge of the dog that bites them. Dog bites can range in severity from mild to extreme, and many times are the result of the owner’s negligence. States differ in the way they handle dog bite personal injury cases; some states have a “One-Bite” law, addressing any first injury a domesticated dog inflicts, while others impose strict liability on the owner. The injuries are mostly caused by the dog. The victim was not trespassing when he or she was bitten. The victim did not provoke the dog in any way. If these criteria are met, the owner will be held liable whether or not he or she knew the dog was aggressive or prone to biting. Because of this, the victim of the dog bite does not generally have to prove fault in a dog bite case. However, the state does allow plaintiffs to prove negligence to claim additional damages, or to receive compensation even if a bite did not occur. For example, if a dog jumps on a person and knocks the person down, resulting in injury, the victim may be able to claim negligence and receive compensation for medical bills. Trespassing is claimed when the plaintiff was on private property without permission. If the plaintiff was found to be trespassing on private property when the dog bite occurred, he or she will not be able to hold the dog’s owner liable. If you have been bitten by a dog or other animal and wish to claim damages in a personal injury suit, contact an experienced attorney as soon as possible. Though the state of Hawai’i has a two (2) year Statute of Limitations, begin building your case as soon as possible. An experienced attorney can assist you in compiling the necessary medical documents and other paperwork to substantiate your case. While there are many types of damages, dog bite personal injury cases usually award for medical expenses, lost work, and/or pain and suffering. Occasionally, other damages may be indicated, but this is not common with dog bite cases. Working with an experienced attorney will help you get the most compensation possible. To explore your options for filing a personal injury suit, contact Attorney Dennis Potts. Based out of Honolulu, he serves people throughout the whole state of Hawai’i. He has over 40 years of trial experience in personal injury cases and will represent your case aggressively. For more information, call him today at (808) 537-4575.